Price includes postage within the U.K. Shipping to the U.S.A. add £25 Western Europe add £10. An antique, French copper, rectangular casserole and cover. This is marked with a number '30' to one end and a number '3' to the other. There is also a number '3' to one end of the lid. The 30 relates to the internal length of the pan. Date: c.1870. This piece has ornate brass handles to either end and also to the lid, which are typically French in shape. 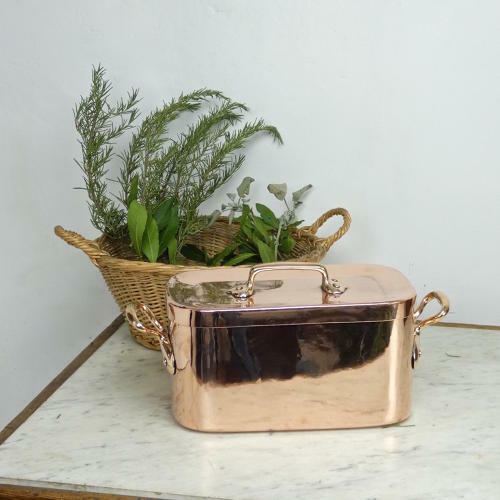 It is well made, from an exceptionally heavy gauge of copper, and it has castellated seams around the base and up the side. It is in excellent condition. In order for it to be used, rather than just decorative, we have had the interior re-tinned. This is done in the traditional manner, as it would have been when the piece was first made. Dimensions of pan: Length 30.2cm. (11 7/8 in) Width 18cm. (7 1/8 in) Height 16.2cm. (6 3/8 in). Total dimensions including the handles: Length 40.5cm. (16 in) Height 19cm. (7 1/2 in).